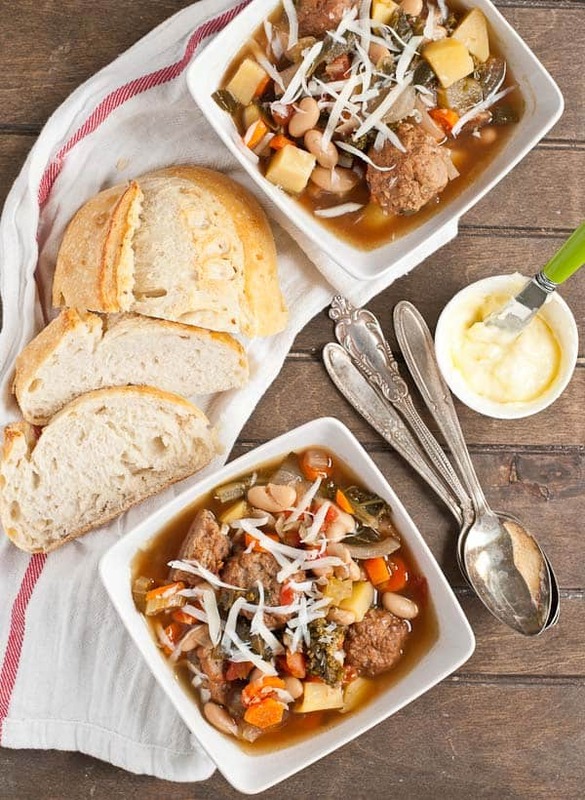 Souper Bowl Week continues with this hearty Slow Cooker Meatball Minestrone. 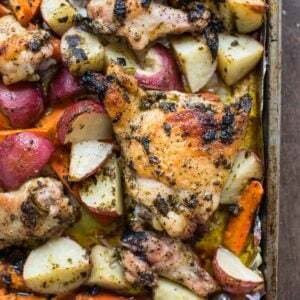 It’s a satisfying one pot meal that only takes 15 minutes to prep! I’m not a very critical movie goer. I enjoy watching a flick on a Friday night, but I’m generally pretty easy to please. Give me a good story, a few laughs, and maybe a heart warming moment or two, and I’m good. While the movies I absolutely love are few, there are also very few movies I hate. But boy, when I do hate a movie, I can’t help but talk about it. This may be one of the most controversial things I’ll ever say on the blog, but here goes. I hated Boyhood. Go ahead and wring me up, argue, praise it until the cows come home. On this, I won’t be swayed. The Mr. and I rented the movie last weekend thinking it was a sure bet. I mean, a coming of age movie filmed over 12 years with the same actors that also happens to be nominated for Best Picture?? How could it not be good? It wasn’t until two hours later when the Mr. and I looked at each other with the same Dear God, when is this movie going to end? expression, that I realized this might not have been the sure bet we thought it was. Granted, the concept is pretty exceptional, and the first half kept my attention, but 2+ hours in, I was over it. The movie paints with such a broad brush, it’s difficult to really dig in and see the impact of any one moment, or experience the ways these individual moments change and shape the young boy. Instead, the movie left me feeling detached, frustrated, and honestly? bored out of my mind. Whew, glad I got that off my chest. 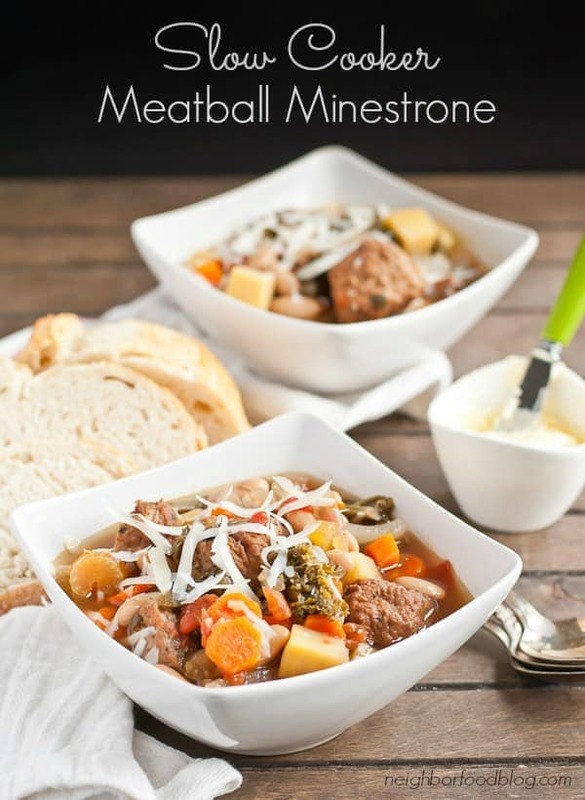 While I cannot endorse Boyhood, there is something else I can recommend on this strong-opinion Wednesday, and it comes in the form of this satisfying Slow Cooker Meatball Minestrone. This soup has all the signs of a winner. It’s easy to make, packed with winter vegetables, and studded with big, fat meatballs. 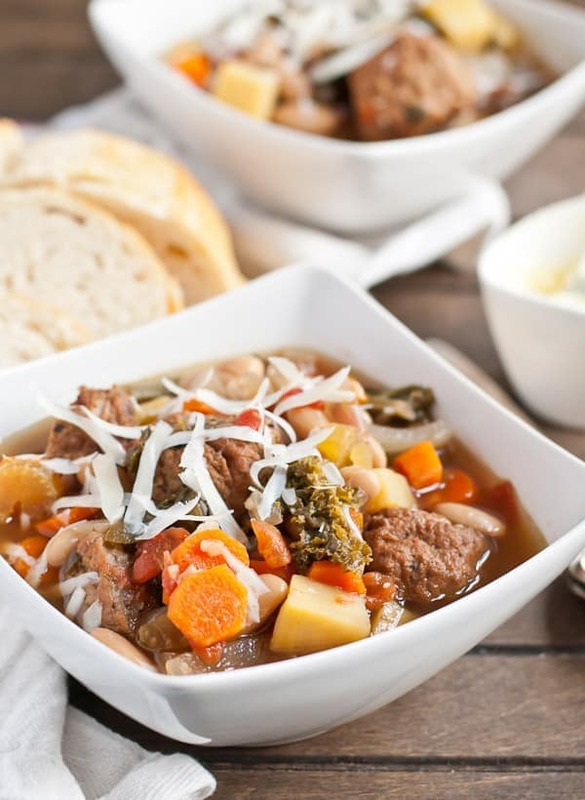 The soup is made in your slow cooker, which allows all the veggies, beans, and meatballs to really soak up the flavor of the broth and get nice and comfy cozy together. This is one of the easiest soups ever. It requires a bit of chopping, but other than that, this is a dump-and-slow-cook-recipe. It’s best served with a heaping pile of freshly grated Parmesan cheese and plenty of crusty buttered bread for sopping up any leftover juices. You can trust the reviews on this one, I promise. This soup delivers, and so do these other highly acclaimed picks from my friends! As part of Souper Bowl week, we’re giving away a gorgeous 5 quart Le Creuset French Oven. Be sure to scroll down after the recipe to find out how to enter! 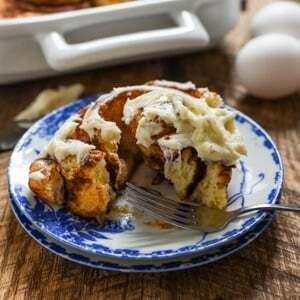 Combine all of the ingredients in a large crock pot. Cook on high for 4 hours or low for 8 hours. Season with additional salt and pepper, if needed. Serve hot with grated Parmesan cheese and crusty bread for sopping up the broth! Good busy day recipe. Easy to put together and cook quickly. I made my own meatballs and only needed half the amount stated. Good taste..
Hi there.. Thot I will just keep you posted.. I saw your pic of minestrone soup shared by dollop_ofsunshine on instagram. Didnt find any credits given to you. I have noticed this user sharing pics of other bloggers on her social media claiming as her own. Thanks so much for letting me know! I will check it out!